If I say Do you know Doraemon? Then it would be a foolish question. Because I don’t think so that there is any child who won’t be familiar with this Doraemon character. Doraemon is one of the most famous cartoons and comic character the world has ever seen. Like Tom and Jerry and Looney tunes, the Doraemon cartoon series is watched all over the world. There are different characters in this Doraemon Series which make this Series interesting and adventurous. Before going to the main topic Doraemon Last Episode, let us have look at the background of Doraemon Series and comic. Doraemon is a cartoon and comic character which is created and visioned by Fujiko F. Fujiya, Japan’s comic writer. Now the question arises what is Doraemon? and What is his role in the Animated series and Comic Book? Doraemon is a Robot cat which came from the 22nd Century to help a poor and underconfident child Nobita. 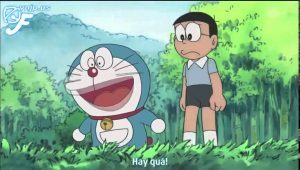 Doraemon is sent by Nobita’s grandson to help his grandfather as he was very lazy and was frightened to do anything by himself. The story of Doraemon revolves around the Nobita. Doraemon is always ready to help Nobita if he falls into a trouble, or Gian makes the situation hard for Nobita. In short, the duty of Doraemon is to take care of Nobita from every hurdle and trouble. Due to which Nobita becomes lazier and dependent upon the Doraemon. Doraemon has a Pocket located on its belly which is full of mysterious objects which are called Gadgets. The Pocket of the Doraemon is 4-Dimensional, and the Gadgets are from the 22nd century. Doraemon uses these Gadgets to help Nobita. These Gadgets are very powerful and can do a lot of things which are almost impossible in the era where Nobita is living. With the help of Doraemon’s Gadgets Nobita can fly, run faster, do his homework without making any mistake. Nobita is not a bright student, therefore, he always gets zero in school exams and tests. His parents are very worried because of Nobita’s poor performance in the school. Doraemon continuously helps Nobita but the outcome remains the same. 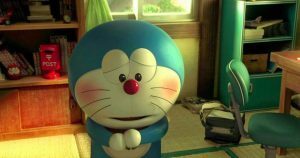 Doraemon knows that when Nobita will come back home after playing or from school he will be in some kind of trouble and will need Gadgets. 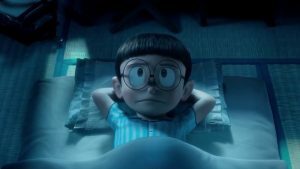 It happens every day and never stops but Nobita didn’t know that the time is about to reach when he will be left alone and there will be no Doraemon to help him. Here the final episode of Doraemon starts. Nobita is coming back to home, he finds the Doraemon and starts crying. After some time he asks Doraemon to give him a gadget. This time I will not let Gian and Suneo they are making fun of me Nobita Says. Nobita is confused, he doesn’t know what happened to Doraemon. He is unaware of the future that his best friend has gone too far, where there is no returning back. Doraemon’s sister Doraemi is watching this incident on time television. She approaches Nobita and tells him about Doraemon’s condition that he is out of battery. Nobita is expecting that there is no need to be worried as the battery is replaceable. But he doesn’t know the real truth. Therefore Doraemi says. 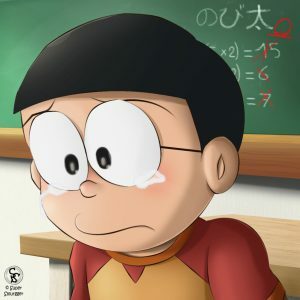 Nobita starts crying as his best friend is gone. If he changes and replaces the battery then Doraemon will lose all of his memory. Therefore, it was a big shock for Nobita. He tries a lot to convince Doraemi to take Doraemon to a future robot factory. So that there can be a solution to this problem without erasing the whole memory. But it was not so simple and easy as Doraemon has lost his ears and Robots need a certain amount of energy to run and memorize anything. In Doraemon case, this is impossible to be replaced. There was a time bug which altered the timeline due to which Doraemi is restricted to her era and cannot come to see Doraemon personally. Nobita asks a lot but due to the timeline disturbance, it is not possible to do such modifications easily. As Doraemon is not alive or he is in asleep, therefore, his pocket is not functional anymore as the pocket needs a certain energy to be operated. Nobita asks for some other solution and requests Doraemi to find out the creator of Doraemon. But the identity of the creator of any robot is classified which cannot be known or find out easily. Now there are only two ways left which can wake up the Doraemon. But these ways are very hard and requires patience and time. The first way is to replace the battery or recharge it. But by doing this the memory of Doraemon will completely be lost and he won’t recognize anyone. All of his memory will be gone. The time Doraemon spent with Nobita will be like never happened and he will be a new cat Robot. The second way of waking the Doraemon is to wait hard until the future technology gets more advanced and superior so that the battery will get charged and memory remains the same. But it was hard to wait and to do so. Nobita was very worried. He sits near Doraemon and starts saying about their great friendship. 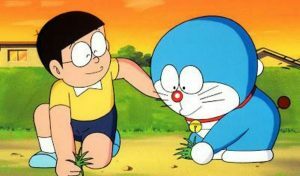 How Doraemon first came and visited Nobita and helped him in his all troubles and supported him when he needed Doraemon’s help. But by doing that nothing happens, Doraemon remains the same and doesn’t respond. Nobita continues his conversation and starts to thank Doraemon for all of his support and time that he helped Nobita. By that time Doraemi visits again and convince Nobita to let Doraemon go and let her replace Doraemon’s battery. He will again recognize Nobita and they will relive and recall the moments they spend. But Nobita wasn’t happy to agree Doremi’s terms and suggestions. Therefore, Nobita takes a vow that he by himself repair Doraemon in the future when he will become the best robotic engineer in the world. He will do his best to wake up the Doraemon and all of the memory will be saved. Nobita is now a different boy, he is alone in this cruel world where Gian is making problems and teasing Nobita at every step. There is no Doraemon to help Nobita from Gian and other problems. But this doesn’t decrease the morale of Nobita as he has thought to make Doraemon alive again. Nobita works hard day and night, he focuses on his education very hard and finally, a time comes when the world sees the new face of Nobita. Doraemon is gone and Nobita is living with this truth, and every day the strength of Nobita increases. Nobita is now in the high school and he is a very bright student like his friend Dekisugi. The school announces the final result and score of exam and Nobita is on the top of the list with 498 marks and Dekisugi scores 475 marks. It is a big change in Nobita as he is now the topper of his class. No one believes this truth as a poor and lazy student how became so brilliant and hardworking even without Doraemon’s help. Shizuka appreciates Nobita’s effort as he tops again. Nobita’s friend asked him to stop as is not a healthy way to get the education. It will be very harmful to Nobita’s health. 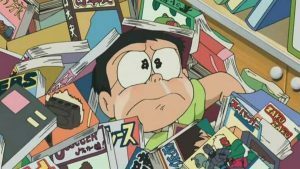 But now there is no stopping for Nobita, even though he is the best student yet he needs to learn a lot and gain more knowledge to help his friend Doraemon and bring him back to life. Shizuka asks Nobita to come and spend some time with her but Nobita refuses the offer, he is now totally focusing on Doraemon’s recovery. Nobita is completely changed, he is not the person his friends knew. Shizuka is very worried, she wants the old Nobita, she cares a lot. But now there is nothing which will stop him. But as we know what are friends for. Nobita’s friends think of a plan to take Nobita on a picnic so that Nobita will share his pain and feelings about Doraemon. Nobita is now completely grown into an adult. He is an engineer now one of the best. He is working very hard to solve the puzzle the time paradox which was created when the Doraemon ran out of battery. Nobita’s friend Gian, Suneo and Dekusugi come and visit Nobita to ask him about his project’s progress. Gian and Suneo always dreamt of a future where time travelling exists. But due to the Time Paradox, it is now very difficult and risky which may change the history and cause a lot of damage. Despite all of these concerns, Nobita is on his track to do anything but to bring back Doraemon. 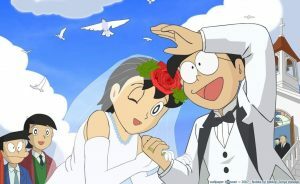 When the time passes Nobita and Shizuka becomes a couple and get married. Shizuka knows the reality that Nobita’s life is not his own, he is living for Doraemon’s project to make him alive. Due to which she supports Nobita and helps him to give more time to his project. The time passes and Nobita gets old but he continues his work in the lab. But the time is not perfect as there are restrictions to do so due to the time paradox. There are no connections of Nobita with the future or Doraemi. He is now on his own to perform the battery replacement of Doraemon. As we know if someone works hard God always help them. Finally, the time comes when Nobita enters his lab where Doraemon was laying on the table. Nobita has got a solution to Doraemon’s problem as he is now a very popular robotic engineer. Shizuka stops Nobita not to enter the lab, but he is very convinced that he can repair the Doraemon. 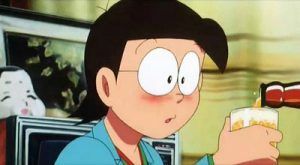 Nobita performs all the test and connects all the required cables which are needed in the battery replacement and asks Shizuka to switch on the button. When Shizuka presses the button an energy spark emerges, everything goes white for some time. This was the Doraemon Last Episode. It is very interesting and emotional. You will love the comic book of Doraemon last episode. This comic book tells us the real truth about the friendship of Nobtia and Doraemon. How a lazy and poor boy who was very afraid of the world becomes the saviour of Doraemon. You people will enjoy this final episode of Doraemon. To know the complete story click on the down button to get the last episode of Doraemon PDF. Thanks.